Happy Quilting: Moroccan Lullaby - Finished Pattern!!! I am so super excited to say I have a new pattern to share this morning, or afternoon. I had planned to work on this throughout the week, but ya, that didn't happen. So I woke up early this morning and have been at the computer for hours, but hey it's done!! So without further ado, the pattern for the Moroccan Lullaby quilt I shared last week is now available!!! I shared lots of details about the actual Quilt in my post last Friday so if you want to see lots more pics and some of the detail and inspiration behind the quilt, click on over here ;) For this post, I just want to share a few details about the pattern. Moroccan Lullaby has 5 size options, a Baby, Lap, Twin, Picnic, and a Queen/King size. and is made of 1 block that has a fantastic intersecting design built into it. BEAUTIFUL QUILT! LOOKS SO FUN TO DO! THANKS FOR SHARING! This is a very attractive quilt pattern! I love this pattern! And I love how you make your patterns: very understandable. Headed to Etsy right now. 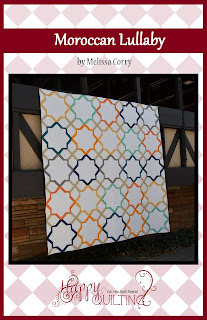 Moroccan Lullaby is a beautiful quilt Melissa and my mind jumps to envisioning it is all sorts of color schemes. So of course I have to add it to my bucket list! It looks like it would be a great way to use scraps too.